In order to share the global information and resources efficiently over a huge network topology, the Space-Air-Ground Integrated Network (SAGIN) system integrates a number of networks for optimal utilization. Nonetheless, the related communication units between the mobile platforms and air-to-ground links are constrained to a low-bit rate radio-based technology. In addition, the required services to be supported demand a high capacity link. This will ensure effective management of multiple information in parallel and in real-time. One of attractive systems with inherent features to support the network demands is the free-space optical (FSO) communication system. Nevertheless, drift support in the SAGIN could be challenging for the FSO system. This is due to the required line-of-sight link alignment between the receiver and transmitter modules. Besides, FSO system is susceptible to the atmospheric turbulence-induced fading. This can be addressed by operating unmanned aerial vehicles in the SAGIN system in swarm mode. Conversely, this can bring about channel correlation eventually resulting into system performance impairments. This paper considers the effect of correlated FSO channel on the SAGIN system outage performance. To accomplish this, we consider exponential model for modeling the correlations between the apertures. Moreover, to account for the spatial correlation for different diversity orders in the air-to-ground as well as air-to-air communications, we employ a multivariate Gamma–Gamma (\(\varGamma \varGamma\)) distribution. The results of the analysis appropriately quantify the effects of the atmospheric turbulence-induced fading as well as correlation on the system outage performance. This work is supported by the European Regional Development Fund (FEDER), through the Regional Operational Programme of Lisbon (POR LISBOA 2020) and the Competitiveness and Internationalization Operational Programme (COMPETE 2020) of the Portugal 2020 framework, Project 5G (POCI-01-0247-FEDER-024539), ORCIP (CENTRO-01-0145-FEDER-022141) and SOCA (CENTRO-01-0145-FEDER-000010). It is also funded by Fundação para a Ciência e a Tecnologia (FCT) through national funds under the project COMPRESS - PTDC/EEI-TEL/7163/2014 and by FEDER, through the Regional Operational Program of Centre (CENTRO 2020) of the Portugal 2020 framework [Project HeatIT with Nr. 017942 (CENTRO-01-0247-FEDER-017942)] and [Project Virtual Fiber Box with Nr. 033910 (POCI-01-0247-FEDER-033910)]. Chlestil, C., Leitgeb, E., Schmitt, N. P., Muhammad, S. S., Zettl, K., & Rehm, W. (2006). Reliable optical wireless links within UAV swarms. In 2006 international conference on transparent optical networks, (vol 4. pp. 39–42). https://doi.org/10.1109/ICTON.2006.248491. Wu, Z., Kumar, H., & Davari, A. (2005). Performance evaluation of OFDM transmission in UAV wireless communication. In Proceedings of the thirty-seventh southeastern symposium on system theory, 2005. SSST ’05., (pp. 6–10). https://doi.org/10.1109/SSST.2005.1460867. Heng, K. H., Liu, N., He, Y., Zhong, W. D., & Cheng, T. H. (2008). Adaptive beam divergence for inter-UAV free space optical communications. In 2008 IEEE photonicsglobal@Singapore, (pp. 1–4). https://doi.org/10.1109/IPGC.2008.4781473. Zhou, L., Last, M., Milanovic, V., Kahn, J. M., & Pister K. S. J. (2003). Two-axis scanning mirror for free-space optical communication between UAVs. In 2003 IEEE/LEOS international conference on optical MEMS (Cat. No.03EX682), (pp. 157–158). https://doi.org/10.1109/OMEMS.2003.1233514. Alimi, I., Shahpari, A., Sousa, A., Ferreira, R., Monteiro, P., & Teixeira, A. (2017). Challenges and opportunities of optical wireless communication technologies. In P. Pinho (Ed. ), Optical communication technology. Rijeka: InTech. https://doi.org/10.5772/intechopen.69113. Leitgeb, E., Zettl, K., Muhammad, S. S., Schmitt, N., & Rehm, W. (2007). Investigation in free space optical communication links between unmanned aerial vehicles (UAVs). In 2007 9th International conference on transparent optical networks, (vol 3. pp. 152–155). https://doi.org/10.1109/ICTON.2007.4296268. Muhammad, S. S., Plank, T., Leitgeb, E., Friedl, A., Zettl, K., Javornik, T., & Schmitt, N. (2008). Challenges in establishing free space optical communications between flying vehicles. In 2008 6th international symposium on communication systems, networks and digital signal processing, (pp. 82–86). https://doi.org/10.1109/CSNDSP.2008.4610721. Qi, W., Hou, W., Song, Q., Guo, L., & Jamalipour, A. (2016). Topology control and routing based on adaptive RF/FSO switching in space-air integrated networks. In 2016 IEEE global communications conference (GLOBECOM), (pp. 1–6). https://doi.org/10.1109/GLOCOM.2016.7842334. Liu, H., Zhang, J., & Cheng, L. L. (2010). 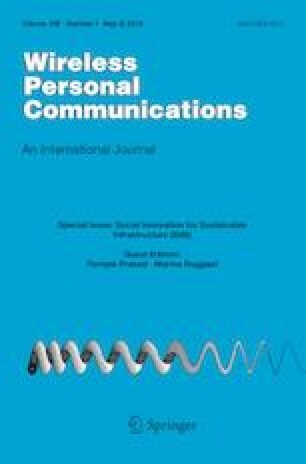 Application examples of the network fixed point theory for space-air-ground integrated communication network. International congress on ultra modern telecommunications and control systems (pp. 989–993). https://doi.org/10.1109/ICUMT.2010.5676493. Yang, G., Khalighi, M. A., Ghassemlooy, Z., & Bourennane, S. (2013). Performance evaluation of correlated-fading space-diversity FSO links. In 2013 2nd International workshop on optical wireless communications (IWOW), (pp. 71–73). https://doi.org/10.1109/IWOW.2013.6777780. Alimi, I., Shahpari, A., Ribeiro, V., Kumar, N., Monteiro, P., & Teixeira, A. (2016). Optical wireless communication for future broadband access networks. In 2016 21st European conference on networks and optical communications (NOC), (pp. 124–128). https://doi.org/10.1109/NOC.2016.7506998.